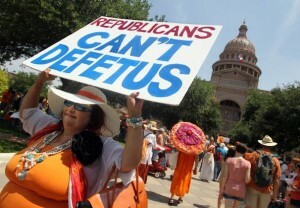 We discuss the demonstrations in support of reproductive rights in Austin, Texas. A special state legislative session is currently in progress, called for by Governor Rick Perry with the intention of pushing forward anti-abortion legislation. This has sparked large protests at the Capitol. We are joined by Rocio Villalobos, one of the demonstrations’ organizers, who works at the University of Texas at Austin’s Multicultural Engagement Center and organizes with local immigrant rights and and women’s rights groups in the Austin area.